Philips confirms 903 OLED TV with built-in B&W soundbar | What Hi-Fi? Bowers & Wilkins has teamed-up with Philips to give its new OLED TV a sonic upgrade. The wraps have come off - somewhat inadvertently - the new collaboration from Philips and B&W. It comes in the shape of the new 65-inch Philips OLED903 TV, which has an integrated soundbar that's been designed in conjunction with Bowers & Wilkins. Described as a new reference standard sound system, the TV speaker includes four drivers in an enclosure covered by acoustically-transparent Kvadrat cloth. The OLED TV with B&W sound system is the first fruit of the exclusive partnership, which was announced earlier this year. The TV is due to be unveiled at the IFA 2018 show at the end of the month, but news that the product has won an EISA Award (Expert Imaging and Sound Association) seems to have jumped the gun. That said, details are thin on the ground. The Philips 903 sits above the 803, which was announced along with Philips' full 2018 TV range at the start of the year, and shares the same picture tech as the rest of the new 2018 OLED Panels. This includes new anti-reflective coatings for better black reproduction and a 1000 Nit peak light output - a 10% increase in light output compared to the 2017 models. 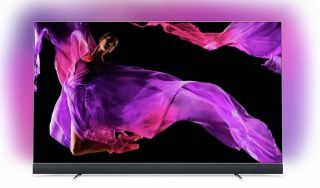 The 803 and 903 4K OLEDs also both feature the 2nd Generation P5 Picture Perfect Processing Engine, which Philips calls, "a patented intelligent algorithm" designed to boost SDR video quality. There's also three-sided Ambilight and the Nougat Android TV OS. An upgrade to Android O will bring Google Assistant and Amazon Alexa voice control in the "near future". The 803 goes on sale this month, while the 903 will be available to buy from October 2018.